In this missive, we are just going to focus on the “WTF!” moment of this past week. In order to do this properly, I need to start with last week’s missive where we asked the question “Did Something Just Break?” In that article we addressed very specific concerns about interest rates and the problem they were going to cause. We also updated the pathway analysis for the highest probability outcomes over the next couple of months. While the majority of the pathway’s accounted for a continued corrective, consolidation, process through the end of the year. It was Pathway #3 which came to fruition. Of course, you can now add Hurricane Michael to the list. But don’t forget the current spat of economic growth this year was from the 3-massive Hurricanes in 2017. “In the event you’re hoping the virtuosity of panic buying can become a permanent prop to the economy, you might want to rethink your thesis. But it isn’t just the rise in interest rates, and the threat of slowing economic growth, that is most concerning for the outlook of investors going forward. Both of those issues also translate into weaker earnings growth as well. 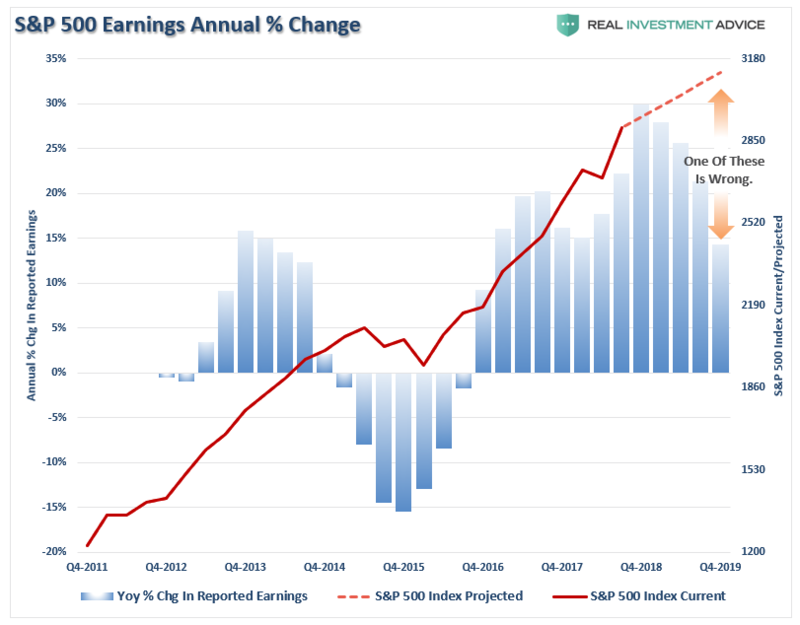 The issue of earnings, combined with higher rates, tariffs, and valuations, will likely continue to way on asset prices as we move into 2019. 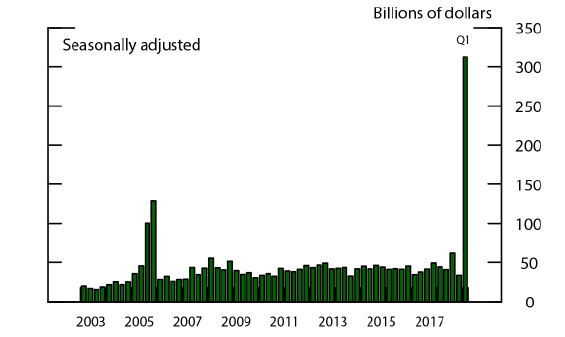 The one bright spot going into the end of this year is that corporations have been in a “blackout” period for buying back their own shares heading into Q3-earnings reporting period. By the beginning of November, that restriction will be lifted and the markets will likely get some support from an acceleration of buybacks headed into year end. However, as stated, that growth will become much more muted. With the understanding the economic and fundamental background may not be supportive for higher asset prices heading into 2019, the market is also sending a very different technical signal as well. As I showed on Thursday, this is the FIRST time the market has broken the bullish trend line that began in 2016. As shown below, that break of the bullish trend pulls in a new dynamic of potential market action over the next several months which is more akin to a market topping process than the continuation of the previous bullish trend. 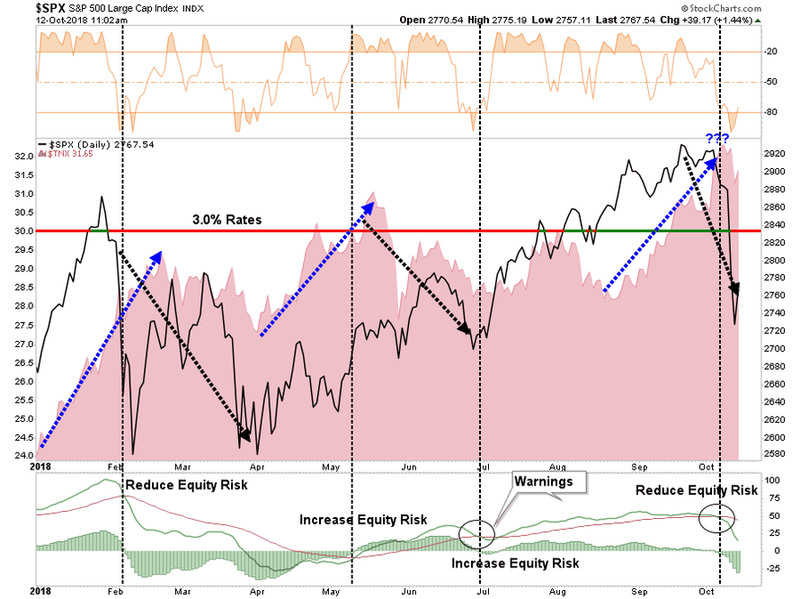 “Given the short-term OVERSOLD condition of the market, we want to use rallies to rebalance risks in portfolios. 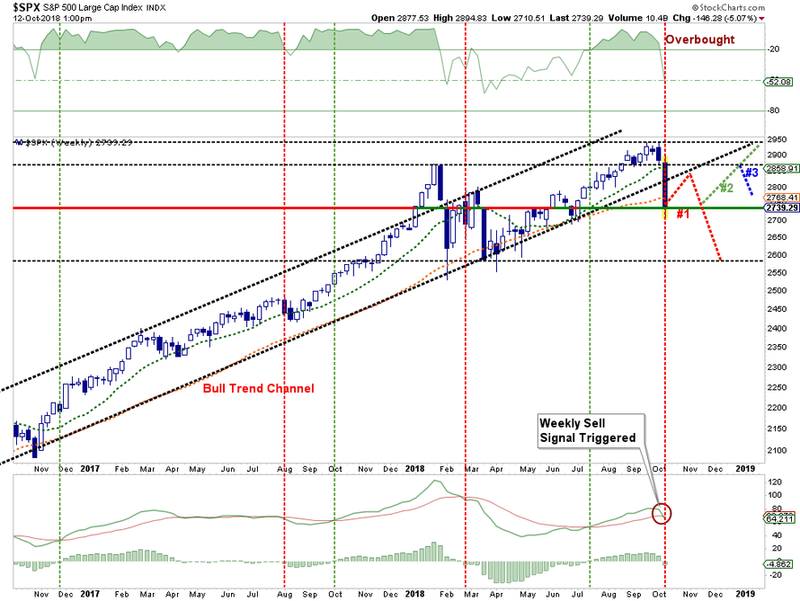 #1 – A rally back to the bullish trend line will be used to reduce risk (ie. raise cash) in portfolios by selling lagging positions and rebalancing risk in winning positions. Rule: sell losers and let winners run. We fully expect an initial rally to fail as investors caught in the sell-off will be looking for an opportunity to sell. However, if that sell-off fails to hold support at the recent lows it will suggest a bigger corrective action is in process. We will be looking to reduce equity risk further, raise cash, evaluate portfolio allocation models. 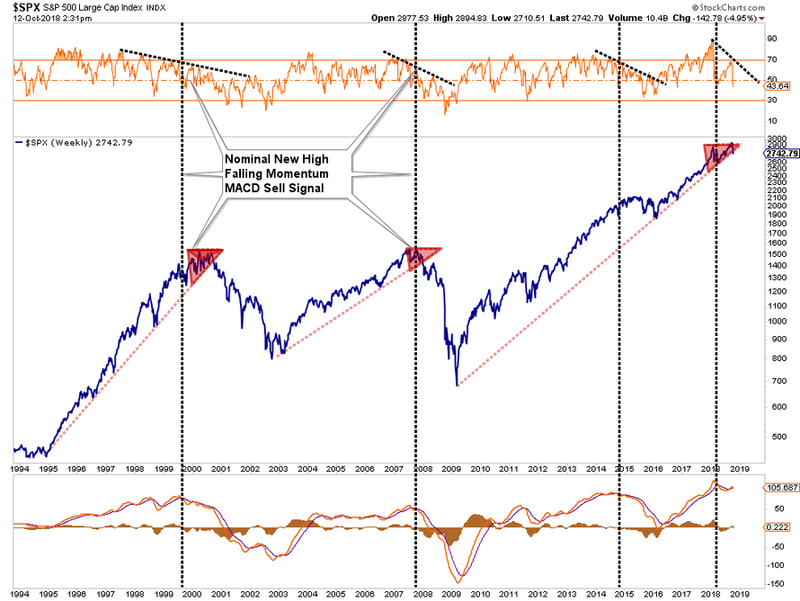 #2– If the sell-off following a failed rally holds support at the recent lows, and turns up, such will suggest a rally back to either the January highs or all-time highs. NOTE: A rally back to all-time highs following a corrective pullback will again retest the underside of the bullish trend line from the 2016 lows. Such remains a ‘bearish’ backdrop from equity risk going into 2019 where economic and earnings data is expected to slow further. We will use any rally back to those levels to reduce risk as noted in #1. As shown in the chart below, the market was more than 4-standard deviations below its 50-dma on Friday. This is a very rare event and is an extreme oversold condition. However, along with the evidence above, also suggests the recent bull market trend is finished for the time being. Portfolio management processes should be switched from “buying dips” to “selling rallies” until the technical backdrop changes. 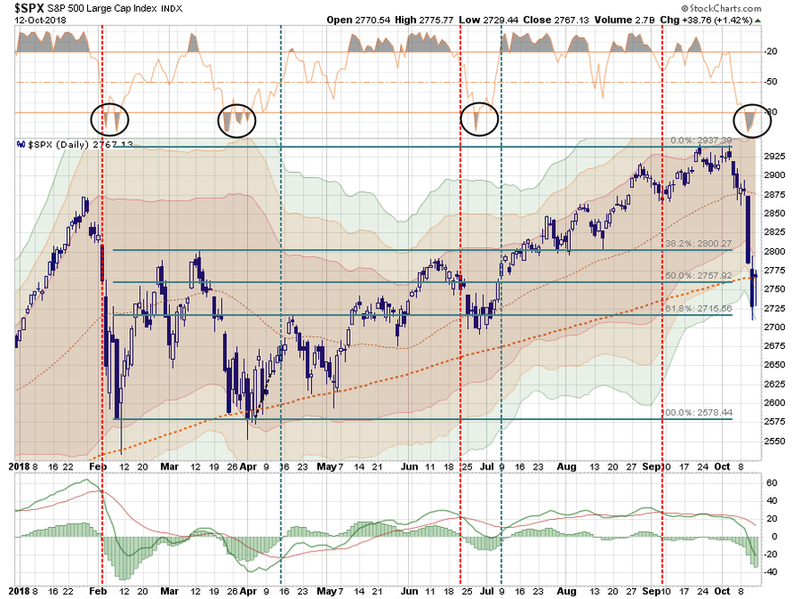 Next week, I would expect to see a rally from the short-term oversold conditions. The good news is that the market WAS ABLE TO CLOSE ABOVE THE 200-DMA on Friday which will keep buyers (algos) in play into next week. However, it will be the breadth and strength of that rally that will be important to watch. If it is a weak, narrow bounce with little conviction, use the rally to lift positions, trim losers, raise cash and potentially look at initiating some hedges. We now know that was indeed the case. As stated, it is highly unlikely the bull market will quickly resume without a further shakeout first. This doesn’t mean we can’t have some hellacious rallies in the meantime. However, the entire supportive structure of the market has now changed which suggests a very different set of actions need to be taken on rallies over the next several months. Here is what we will specifically be doing on subsequent rallies. The end of bull markets can only be verified well after the fact, but therein lies the biggest problem. Waiting for verification requires a greater destruction of capital than we are willing to endure.